The coastline of North Carolina is unique in that beach-goers have ample opportunities to explore the shoreline from the comfort and convenience of a 4WD vehicle. From the northern Outer Banks along the Virginia state border to the sunny beach towns that border Wilmington, visitors will find that there are plenty of options when it comes to cruising the coast. One of the most popular regions for off-road explorations is the southeastern corner of the state, also known as the Cape Fear and Brunswick shorelines. With several stretches of beach that are wide open to 4WD vehicles, and lots of amenities in the area including restaurants, lodgings, and attractions, driving on the beach in the Cape Fear and Brunswick areas is an enticing activity with plenty of appeal, and plenty of ways to have fun on and off the sand. Take a closer look at the areas of southeastern North Carolina that are open to beach driving, and what you need to know before you hit the off-road. We've put together a short list of recommended items to get unstuck and stay safe. We like these linked products, but we took care to make sure they are highly-rated by many customers. Some of the product links include affiliate codes. *If a purchase is made, OuterBanks.com is paid a commission for the referral. Traction Mats - These make it easy to drive out of ruts when you've dug into the sand. High CFM Air Compressor - Save time and air up quickly. Tow Strap - Just in case. Allows anyone to tow you out of a tough spot. Or, help a 4x4 friend. Folding Shovel - Compact and capable of digging you out quickly. Tire Pressure Gauge - You'll need this in combination with your compressor. First Aid Kit - The further you are from roads, the more important this becomes. Fire Extinguisher - Another emergency essential in 4x4 terrain when emergency responders are miles away. Located just north of the busy coastal town of Carolina Beach, Freeman Park is a popular destination for folks who prefer a quieter stretch of shoreline. Extending for more than a mile from the town’s borders north to Carolina Beach Inlet, Freeman Park is a great area for day trippers, campers, fishermen, beachcombers, surfers, and anyone who enjoys an undeveloped stretch of sand. Visitors can access Carolina Beach via US 421, or a number of other roads and routes that trickle east from Wilmington. Once you are in the town of Carolina Beach, head north until the paved road ends, and the entrance sign to Freeman Park can be spotted. Visitors will find all sorts of options for lodgings in Carolina Beach, which is adjacent to Freeman Park, and is a popular vacation destination in its own right. For a more rustic experience that never leaves the borders of Freeman Park, visitors can also camp within the park itself, while keeping the following rules and guidelines in mind. Camping is allowed at Freeman Park year-round, in a vehicle or in a rustic campsite along the shoreline. From April 1 until September 30, camping is allowed in designated campsites with a paid reservation. Reservations for overnight camping are around $30 per night, and are available on a first come, first serve basis. Reservations are only available online, and can be obtained via https://www.carolinabeach.org/visitors/freeman_park/freeman_park_camping.php/. From October 31 until March 1, there is no reservation or fee to camp on the beach in Freeman Park. Glass containers are prohibited, as is spirituous liquor and / or fortified wine within Freeman Park. Trash must be removed by all visitors, as a “Pack it in, pack it out” policy is in place. Trash cans are stationed throughout the park, however, visitors will want to bring along extra bags and receptacles to be on the safe side. Pets are allowed within Freemen Park as well, but must be on a leash from April 1 through September 30. Campfires are allowed provided they are within 10 feet of the dune line, and are completely extinguished with water, and not sand. Visitors should note that while Carolina Beach is an easy drive away, there are no amenities within the park itself, such as stores or electrical outlets and hook-ups. As such, be prepared for a rustic experience where the oceanfront beaches provide the entertainment. Freeman Park has its own distinctive set of rules and regulations for folks who want to cruise on the sand. These guidelines for beach driving in Freeman Park are as follows. All 4WD vehicles who want to enter Freeman Park will have to obtain an access pass. Passes are sold at the entrance to the park via a pay station that is open 24 hours a day. The pay station accepts both cash and credit cards. Daily passes cost around $40 and can also be obtained online via https://freemanpark.clickandpark.com/. Annual and / or family passes are also available. The speed limit within Freeman Park is 15 mph throughout the shoreline. Motorists should obey all state traffic laws while driving, which includes wearing a seatbelt, having no open containers, and not driving while intoxicated. Riding on bumpers, hoods, or the tailgates of vehicles is prohibited. Trailers and ATVs are not allowed within Freeman Park at any time. All vehicles should have a valid license plate, inspection, and registration from the driver’s state of origin. All drivers should have a valid license. Major repairs to vehicles is not allowed in the park, or in Carolina Beach managed parking lots. All visitors should carry a tire gauge, and should air down their vehicles to 20 psi or less before entering Freeman Park to avoid getting stuck. It is recommended that drivers bring along a tow rope/chain, board, jack, and shovel in case the vehicle gets stuck in the sand. With more than six miles of shoreline to explore, Fort Fisher State Recreation Area is a paradise for beach-goers who want to find a stretch of beach to call their own. Though popular in the summer months, Fort Fisher is refreshingly isolated and quiet in the cooler off season, and it connects with the adjacent Zeke's Island Estuarine Reserve – an undeveloped part of the Coastal Reserve and National Estuarine Research Reserve (NCNERR) system which encompasses 1,635 acres, and which is actually comprised of multiple islands. Simply put, Fort Fisher State Recreation Area is a great place to cruise the beach, and enjoy miles of ocean views. From the west and south: Visitors can take the Fort Fisher / Southport vehicular ferry, which is a short 35 minute free ferry ride that departs from the inland town of Southport. From the north: Visitors can follow US 421 south through the towns of Carolina Beach and Kure Beach to reach the entrance of the Fort Fisher State Recreation Area, just south of the Kure Beach town borders. While camping is not allowed within the Fort Fisher State Recreation Area, visitors will find plenty of accommodation options just a shell’s throw away from the park entrance. Vacation rental homes and condos, hotels, and motels are all abundant in Kure Beach, Carolina Beach, and Southport, and campers can also stay in the Carolina Beach State Park and the Freeman Park, which are both located north of Fort Fisher. As a North Carolina state park, Fort Fisher has its own set of guidelines when it comes to exploring the local shorelines via a 4WD vehicle. Here are the rules of the off-road for the Fort Fisher State Recreation Area. 4WD vehicles may drive within the Fort Fisher State Recreation Area year-round. 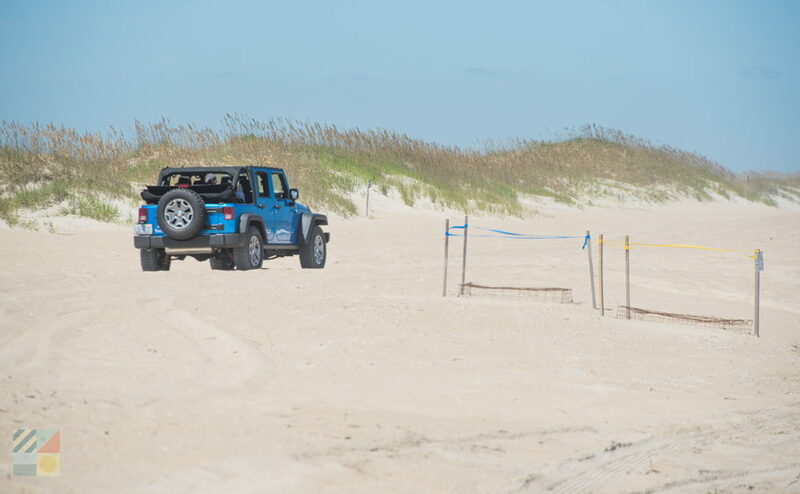 4WD vehicles are allowed within Fort Fisher State Recreation Area 24 hours a day from September 15 until March 31. During the rest of the year, vehicles are allowed 30 minutes before the seasonal closing time of the park. 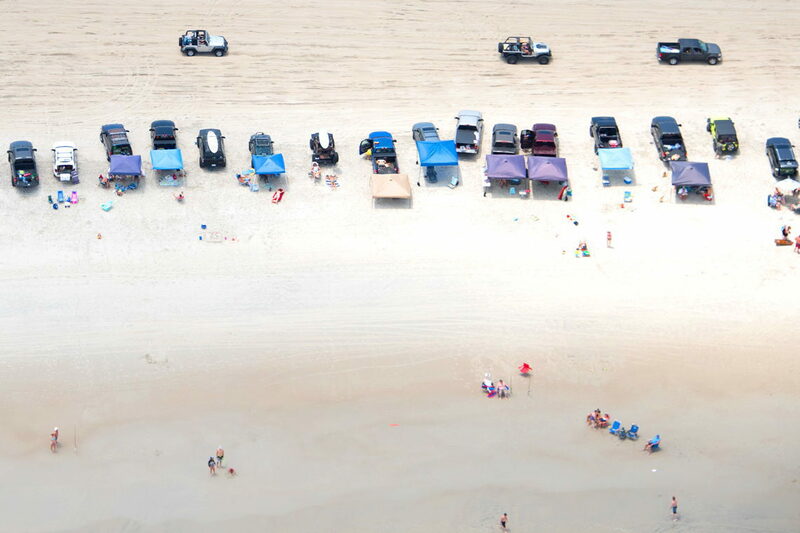 A vehicle must have a valid park-issued permit to access the beach. Permits are sold at the park’s visitors center daily from 8 a.m. until 5 p.m., and cash, money orders, and checks are accepted. Permits are around $15 for weekdays and $25 for weekends. An annual pass is also available for $60. Trailers are NOT allowed to be towed on the beach. All vehicles must be registered with a valid license plate and inspection. Drivers should lower their tire pressure to 20 psi at most to avoid getting stuck, and should carry along boards, a shovel, and other equipment to get out of soft sand as needed. Watch for seasonal sea turtle or bird nesting closures, which may occur in the summer months within Fort Fisher State Recreation Area and Zeke’s island Reserve. Though there are no towns within Brunswick County that allow beach driving with the exception of designated 4WD emergency vehicles, the Brunswick Islands are wonderfully close to the Fort Fisher State Recreation Area, where beach driving is allowed year-round. To get there, visitors can take the short 35 minute vehicular ferry that departs from the town of Southport, and which runs multiple times per day, all year long. Reservations are not required, and the ferry is free. From the Fort Fisher ferry terminal, the Fort Fisher State Recreation Area park entrance is just a five minute or so drive away. See above for more information on beach driving guidelines for the Fort Fisher State Recreation Area. Do I need to have a 4WD vehicle to drive on the Cape Fear and Brunswick beaches? 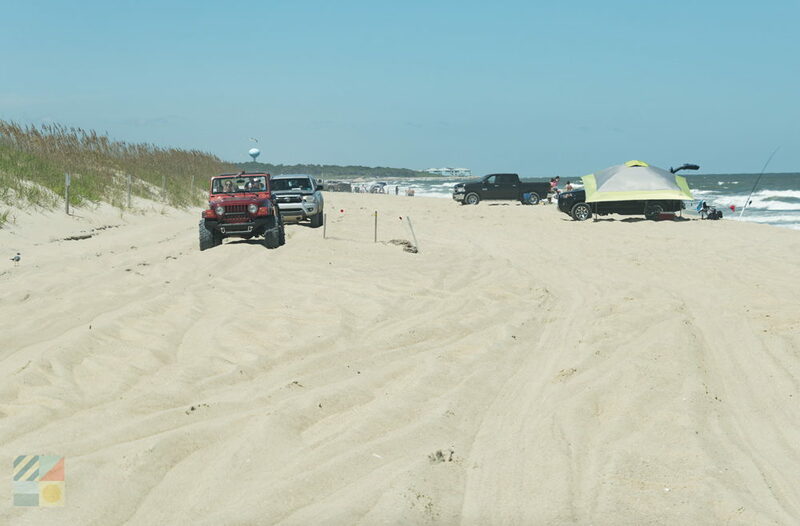 A 4WD vehicle is required to drive on the beaches in Fort Fisher and Freeman Park, due to the absence of paved roads, and the soft sand. Do not attempt to drive on the beaches in an AWD vehicle. Where is beach driving not allowed in the Cape Fear and Brunswick island areas? Beach driving is not allowed in the coastal communities of Brunswick County, and is only permitted in Freeman Park and the Forth Fisher State Recreation Area / Zeke’s Island in the Cape Fear region. How can I avoid getting stuck while driving on the Cape Fear beaches? The most important thing that drivers can do to avoid getting stuck is to air down their tires to 20 psi or less. In addition, follow established tracks on the sand, and do not drive too close to the tide line, where the sand can be especially soft. Are there tow truck companies in the Cape Fear and Brunswick areas in case I get stuck? There are several tow truck companies available in the Carolina Beach area to assist vehicles that have gotten stuck within Freeman Park and Fort Fisher. Note that major repairs are not allowed on the beach within Freeman Park. Is there a speed limit for beach driving? The speed limit for beach driving will be posted close to the parks’ entrance. The speed limit throughout Freeman Park is 15 mph. Are there laws for driving on the beach in the Cape Fear area? All traffic laws for the state of North Carolina apply on the beach as well. This includes having a valid driver’s license, wearing a seatbelt, having no open containers in the vehicle, and not driving while intoxicated. Does it cost money to drive on the beach in the Cape Fear area? A fee-based permit is required to drive within Freeman Park as well as Fort Fisher State Recreation Area. Daily and annual passes are available at both parks. Where can I get air for my tires after I have driven on the beach? The towns of Carolina Beach and Kure Beach has several gas and service stations where air is available to refill your tires after driving on the beach. Can you drive on the Cape Fear beaches at night? Beach driving at night is allowed within Freeman Park, and is allowed within the Fort Fisher State Recreation Area in the off-season months from September 15 until March 31. Will saltwater ruin or damage my vehicle? Saltwater can cause massive and unrepairable damage to vehicles. Stay out of the ocean wash, and avoid driving too close to the tide line in case you get stuck. 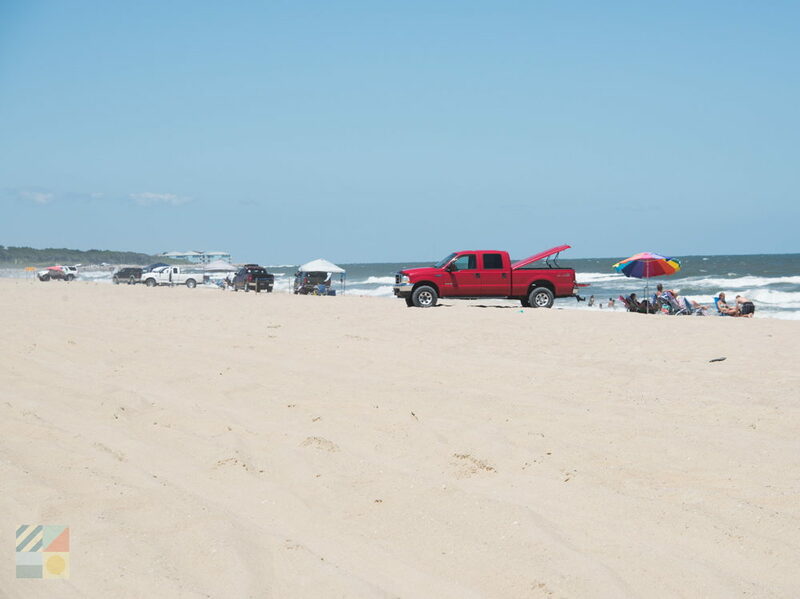 Are 4WD vehicle rentals available to drive on the beach? 4WD vehicles may be available to rent in the Cape Fear area, specifically from a number of companies in Carolina Beach and the neighboring town of Wilmington. Fort Anderson, also known as Brunswick Town, is the historic site of the first permanent settlement in the Cape Fear area. Established nearly 300 years ago in 1726, and destroyed just a few decades later by British Soldiers during the start of the Revolutionary War in 1776, visitors can still explore the ancient ruins of this long-gone civilization and enjoy a glimpse into the area’s centuries-deep roots. Enjoy miles of pristine beaches, salt marshes, and scenic views in every direction with a visit to Fort Fisher State Recreation Area. Located just south of Kure Beach, and renowned for its 6 miles of undeveloped shoreline, this sunny beach destination is one of the most popular state parks in North Carolina, and offers miles of fun around every corner. You can find everything under the sun for a fantastic vacation along the Carolina coastline with a visit to Carolina Beach’s own Pleasure Island Rentals. Located in the heart of the action and easy to reach for visitors all along the shoreline, this expansive company is well known for its huge inventory, fantastic customer service, and countless fun experiences in Carolina Beach. Michael’s Seafood Restaurant is an all-encompassing stop for both easy-going seafood meals and catering for casual parties or big events. Located in a central shopping and business section of inland Carolina Beach, this fresh eatery has been wowing patrons of all varieties – from event planners to vacationing families – with a big selection of coastal eats. While Downtown Southport has an ample supply of wide front porches to take a load off and enjoy a breeze, many longtime visitors attest there's no better place to relax than the Southport waterfront Park.